Deadphones: Listening to Smartphones Dumb for Pedestrians? Deadphones: Is Listening to Smartphones a Dumb for Pedestrians? Amazon announced their new device, the Fire Phone, this week. One of the phone’s impressive features is “Firefly,” a technology which allows Fire smartphone users to scan surrounding products and find cheaper alternatives online (I’ll give you one guess as to which website will have the cheaper prices). It’s a bad deal for traditional brick-and-mortar stores, but what if this preponderance of digital technology is actually dangerous for foot traffic as well? 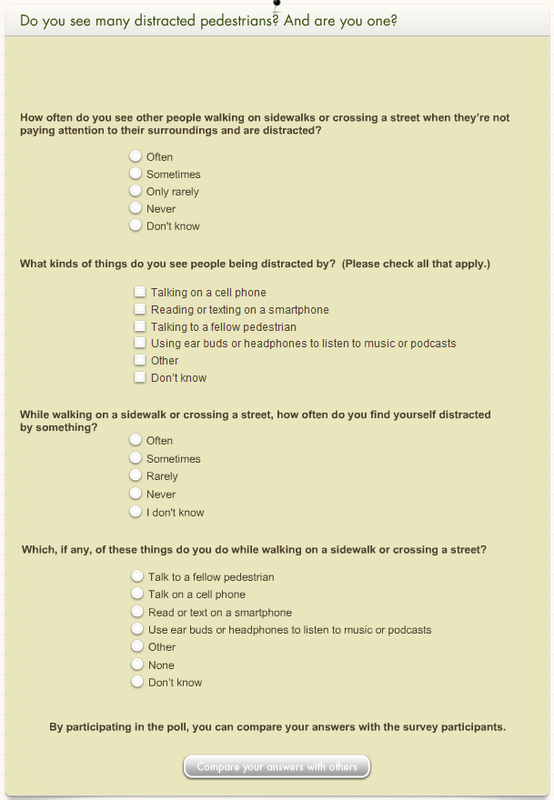 That’s a question Pemco Insurance wants people to think about, based on their latest poll for Washington and Oregon state residents about distracted pedestrians. The poll consists of only four questions. The most frustrating of these questions asks the user what actions they typically engage in while walking (texting, exchanging small talk, listening to Röyksopp & Robyn’s summer jam) and then prevents multiple selections. Reasonable people might understandably question of the efficacy of such a poll, especially one that describes ‘listening to music or podcasts’ as “using headphones or earbuds,” as if our ears have to hold them like they’re hot cups of coffee. So because of this, the poll doesn’t actually do what it’s supposed to (like much of the insurance industry—they’re businesses). But there might be some truth to pedestrian distraction; a study analyzing 116 total accidents involving headphone-wearing pedestrians from 2004 to 2011 (a timeframe that saw the introduction of the iPhone) observed a full third of the vehicles honked before hitting pedestrians. That’s truly startling. People often overestimate their abilities, particularly their ability to multitask. This also applies to something as seemingly innate as our situational awareness. Attention doesn’t work like eyes on a stove; listening can’t be put on the backburner, it can only be ignored. What’s the effect of headphones on pedestrian accident law? Every situation is particular and you should consult an attorney to specifically address your needs. Having said that, wearing headphones could conceivably influence what’s called “comparative negligence,” a law that allows juries to split the blame into percentages and assign those percentages to the various people or groups responsible for an accident. Hypothetically speaking, a jury could potentially assign some of the blame to an injured pedestrian, limiting his compensation for even obvious damages, if it were determined that the pedestrian was distracted and therefore partially at fault for causing the accident. Again, it is likely in your best interest to consult with an attorney who is experienced with representing pedestrian accident victims in Washington State. Davis Law Group handles injury claims involving pedestrians throughout Washington state, from Seattle to Chelan. You may schedule a no-obligation consultation with our office by calling our local number at 206-727-4000. I see them EVERYDAY and they have NO CLUE what's going on around them. My job takes me out into the driving force 5 days a week, I'm driving on the roads of our community and they are oblivious to their surroundings. I find it rude, I find them in my way and "WHAT IF" there was an emergency and they had to move out of the way real quick SPLAT! !